To Feel The Song of Seasons in hardcover is the perfect gift for you, and the perfect gift for that special friend. It is available at your Book Store, at Specialty Gift shops and at many Airport Gift Shops. It's almost assured to be a best seller gift selection because the secret feelings the author writes about are alive and they stir the emotions of so many special friends! It's certain to also gain international fame because the feeling of romantic love is known in hearts throughout the world. Romantic love knows no borders and has no price. It's value is in the knowing. This book will stir the heart of all who have felt the inner smile that comes only from the silence of feeling the Song of Seasons. To Feel the Song of Seasons chronicles the existential relationship between feelings felt and love lived. It is an enlightening visit into a definition of romantic love as seen through words. The verse, poetry, and letters tell the poetic story of love found, love lost, and love searched for. Human feelings are displayed in a way that captivates the imagination of the reader until imagery replaces the words; then feelings replace the imagery, as its message becomes a personal message. As you read, you will come to feel the author's feelings. You will come to see the author’s sights, and you will smile with knowing. The display of love as written will surely find a home in your memory and you will want to revisit selected words often in your thoughts. As you do you will come to discover the author’s cadence more precisely. A cadence that will lead you to cherished feelings again and again until you fully understand yourself in love. Written for those who have known romantic love, and those who have come to understand that the knowledge of the need for romantic love is unique to man. 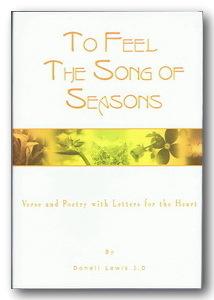 Qualifying members of media may request review copies of "To Feel The Song Of Seasons" by visiting AuthorHouse. Book signing and speaker requests may be made directly to the author, Donell Lewis.